Looking for a women's blazer? We've got them in a range of styles and fabrics to suit all tastes - and finish off any outfit. Popping on a well-tailored blazer can give any woman’s outfit an instant style lift. 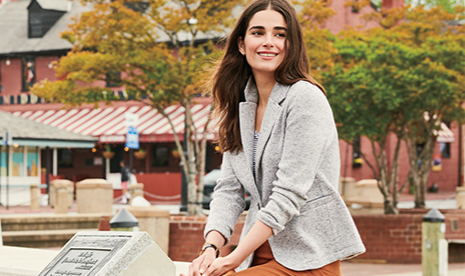 At Land’s End, we offer a range of beautiful women’s blazers to help transform your outfit. Our selection of cosy fleece blazers for women are perfect transitional pieces as the seasons change. A stylish middle-ground between a cardigan and a coat, our fleece jackets feature a smart revere collar and streamlined silhouette for an office-friendly look. If you’re not a fan of fleece, our jersey blazers and wool jackets are equally warming and feature thoughtful details that offer a timeless yet fashion-forward style. As the weather gets warmer, our linen jackets can help you bring a smart-casual twist to your summer wardrobe. Soft, airy and beautifully tailored, our pure linen blazers are fully lined in stretchy cotton so they always keep their shape. Our cropped blazers with three-quarter sleeves are another great option for summer dresses and blouses, whether you’re dressing up for a wedding or rocking a casual look with jeans. Wherever you’re going, and whatever the occasion, dress your Lands’ End blazers up or down with our selection of women’s accessories.